A few short Fridays ago, I woke up to a very cold, wet and windy New York City. After a hotel lobby cup of tea, I stepped out in a simple pair of loafers. One block later, I walked into Nine West and picked up the first pair of leather ankle boots I found. 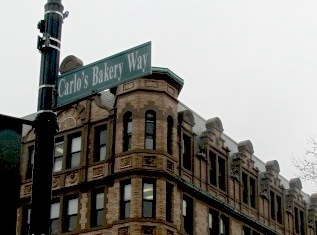 There was no way I'd stay in a wet pair of loafers for my trek out to Carlo's Bake Shop in New Jersey. I arrived in Hoboken excited (and a little too early) for two reasons. One: getting to take a tour of the new factory and join a workshop, and two: I'd finally get to try one of these famous lobster tails that I had heard so much about. The new factory is located a few minutes drive away from the flagship store in Hoboken. Considering I arrived so early, I took myself (and my pathetically jet lagged appetite) to a nearby spot named the Havana Cafe and Lounge. I ordered myself a chamomile tea, and had appetite envy as I watched those around me enjoy colourful Cuban lunches. I was booked in to take the fondant layer cake class, and was very excited to see what it was like behind the scenes in this magical place. The registration waiting area was filled with the aroma of pastries and cakes browning away in not too distant ovens. The walls were decorated with fun photographs of Buddy, and the tables were stacked with albums loaded with hundreds of cakes that had been produced by the team for weddings and other special events in the past. I was happy to meet with Grace, Buddy's sister a few minutes before the beginning of our class and bakery tour. Stay tuned for the next post and get a good look into the workshop, and more importantly, those lobster tails!